How many of you know of this biscuit called Iced Gem Biscuit? I’ve known them as Star Biscuits because of the sweet and colourful “stars” atop the plain and crunchy biscuits. These biscuits bring back fond memories of my childhood as I used to eat them every day as snacks in my kindergarten. Some people like to eat the “stars” then biscuits, some just tipped tons of them in their mouth at once while for some, like me, will want to save the best for last (i.e. the “stars”), so we will always save the sugary treat last. While baking some mini choux a few days back, I was thinking of something to top the choux with, and I was suddenly reminded of these biscuits. After some googling, I found another blogger who have made this too – and her photos are much more amazing than mine! Instead of using food colouring, I used dried food powders to colour the royal icing – so I had strawberry for pink, matcha for green and lemon for yellow, so the colours did not turn out as intense as the real biscuits. The royal icing is made using pasteurised egg white so no worries on the whole raw egg white issue. I tried filling some of the choux with pastry cream but the amount of pastry cream inside was too little and the sweetness of the royal icing overwhelmed everything. So I’d suggest leave it plain or make some uber dark chocolate mousse to fill them the next time. Overall it’s a very cute-looking treat and I love how it brings back fond memories of my childhood. Hope it brings back some of yours too! I’m submitting this to Aspiring Bakers #34: Choux Party hosted by me! 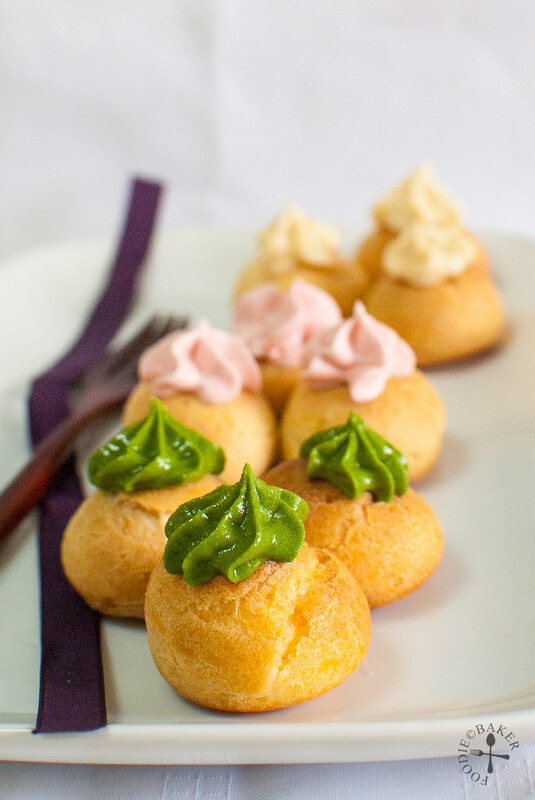 Do bake some choux, give it a makeover and photo shoot, blog about it and join me in the party! 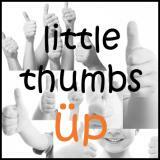 I’m also going to submit this to Little Thumbs Up organised by Doreen from my little favourite DIY and Zoe from Bake for Happy Kids, hosted by Yen from Eat your heart out. The recipes are all linked at this post! Preheat the oven to 200 degrees Celsius. Line baking sheets with baking parchment. Combine water, butter, sugar and salt in a pot. Heat the mixture over high heat, stirring occasionally with a wooden spoon, and bring it to a rolling boil. Add in all the flour at once, turn off the heat and stir quickly with the wooden spoon to mix in all the flour. Once the flour has been mixed in, turn on the heat to medium-low and continue mixing with the wooden spoon until the mixture forms a soft dough and that you can see a layer of dough at the bottom of the pot. Remove from heat and transfer the dough into a mixing bowl and let cool slightly. Add in the eggs, a little at a time, beating well (either with an electric mixer or wooden spoon) until the egg has been fully incorporated before adding the next bit of eggs. 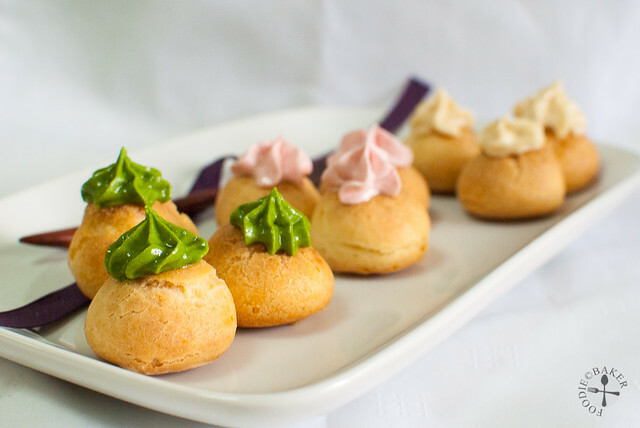 Transfer the choux into a piping bag fitted with a ½-inch or ¾-inch tip. 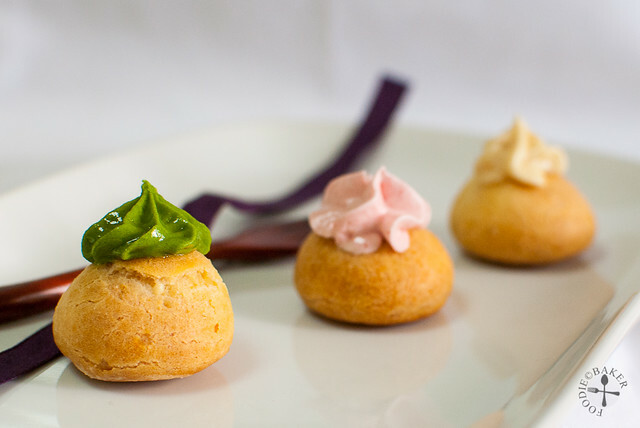 Pipe ¾-inch or 1-inch mound of choux (as small as you can go), leaving 1½ inches between each mound of choux. Dampen your fingers and press the tip of the choux down gently to get a smooth top. Spray the surface of the choux with a little water immediately before baking. Bake the puffs for 10 minutes at 200 degrees Celsius. Lower the heat down to 175 degrees Celsius and continue baking for 15 minutes until the puff is golden brown. During baking, no matter how excited you are, do not open the oven to check them as it will cause the puffs to deflate. Turn off the oven, leave the oven door ajar and let the puffs cool in the oven for 5 minutes. Pierce a hole on the bottom or side of the puff to release steam. Continue to let it cool in the warm oven for another 30 minutes. Remove from oven and let them cool completely on a wire rack. Combine egg white powder, water and icing sugar in a large bowl. Beat with an electric mixer on medium speed until stiff peaks formed. Divide the royal icing and mix in the food colouring or food powders. Use as desired. Pipe royal icing stars on top of the choux and let the icing harden at room temperature. Store in an airtight container. I’ve not heard of this pretty little treat but they look delicious. Hi Jasline, I like your choux version of gem biscuits. I remember eating loads of these during my childhood… so hard to find them nowadays! Thanks for linking this to LTU! Hi Baby Sumo, thank you! Haha yes they were my daily snack when I was in the kindergarten! Very hard to find shops that sell all these childhood snacks anymore! Only remember there’s a shop near Casuarina at Upper Thomson that sells all these childhood snacks! Jasline , one of your best bakes yet ;D The choux look perfectly-baked and with the pretty icing on top , they sure are pretty delish ! I , too , love those gem biscuits ! Hi Anne! Thank you so much for the compliments! These are so kawaii!!!! Love your take on this! Hi Emily! Thank you for the compliments! Lovely choux gems! I do remember those biscuits! One of my favourite biscuits when I was young, and especially love the ones with yellow stars! 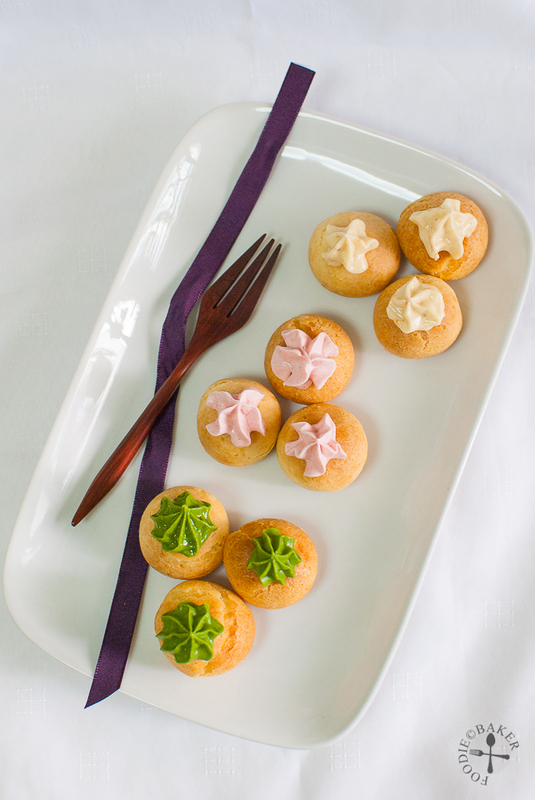 Your choux star gems looks wonderful! Will be making some choux soon! Hi Joyce! Thank you very much! Can’t wait to see what you are whipping up in the kitchen! I think your little gems look pretty amazing. I’ve never heard of Ice Gem Biscuits but I’m so glad I have now. They sound yummy! Hi Doris! It was my favourite too! This is all kids childhood must eat biscuit! Hi Jozelyn, I agree! This really brings back lot of fond memories, doesn’t it? These “chouxs” are so delicate and sophisticated. Hi Daniela, thank you so much for the compliment!